If there is one thing almost everyone needs, it is a little yoga before bed! Whether you sleep like a baby or toss and turn all night, yoga is incredibly beneficial. Practicing yoga at any time of day can reduce stress, regulate your hormones, lengthen and strengthen your muscles, and calm your nervous system. Practicing yoga before bed can give you all of those benefits plus some! According to Do You Yoga, practicing yoga at night can help you sleep longer and deeper, undo the stress of the day, alleviate sore muscles, and prevent pins and needles. Here is the perfect bedtime yoga sequence to nourish your body and soul before you drift off to dreamland. In many spiritual traditions, the feet are considered a sacred part of the body. In Hindu traditions especially, devotees show great respect and love to their teachers by washing and kissing their feet. Taking care of your feet before bed is a wonderful way to boost self-care and set the tone for a relaxing evening. You might want to start by doing an Ayurvedic footbath. Depending on the time of year and your dosha, this process might look different. If you run hot, you can wash your feet in cool water with herbs like peppermint and chamomile. If you are stressed, turn to essential oils like lavender and wild orange. If you run cold, warm your feet by washing them with warm ginger tea and rose water. No matter what, no footbath is complete without a dose of Epsom salt. After massaging your feet, it’s time to tune in to your breath. Not all pranayama is suitable before bed. In particular, you want to avoid practices like Breath of Fire and alternate Nostril Breathing as they heat and energize the body. You want to focus on pranayama practices that are cooling and emphasize the exhale, as those will calm your body and get you ready for bed. It will also purify your lungs and rid your lungs of any stagnant air, fine debris, alkalize and oxygenate your body. One of the best pranayama exercises to do before bed is the 7-2-11 relaxing breath. 1. Inhale gently through the nose to the count of 7. 2. Retain the breath for the count of 2. 3. Exhale to the count of 11, sighing if you wish. After those first two steps, you will likely be in a very different headspace from when you began! However, it is still a good idea to get the kinks worked out of your body before you spend 8+ hours in relatively the same position. A great restorative posture for tight legs is the wide-leg forward fold against the wall. Anything that stretches the backside of the body is going to be more cooling and relaxing. 1. To begin, place your yoga mat horizontal against the wall. 2. Get into a wide stance with your feet turned in slightly. 3. Press your buttocks against the wall as you come into a forward fold. 4. If needed, place your head on a block or the floor. 5. You can also cross your arms and hang for a spinal release, or tilt your torso to the left and right to add in a little side-stretch. This pose is especially relaxing if you pair it with a restorative yoga bolster or folded blanket! Legs Up The Wall, also known by it’s Sanskrit name “Viparita Karani,” reverses the flow of fluids in your body. When fluids pool in the legs, you can experience swollen ankles, tired knees, and stagnant lymphatic fluid. Unlike other stimulating inversions, Legs Up The Wall pose achieves the physical benefits of inversions without the high-energy effects. 1. To practice this pose restoratively, youwill need a prop to elevate the pelvis. 2. Kneel next to the bolster or blanket with your buttucks against the wall. 3. Drop down onto your elbow that’s closest to the prop and roll onto your back. 4. Your buttocks should be flush with the wall, so scoot forward if needed. 5. Place your hands on your lower belly or above your head in cactus. 6. Stay for 10-30 minutes. Exit the pose slowly by sliding the legs down the wall and allowing the blood to return. Coming out too quickly can cause head rushes or feinting. Grab a bolster and two to three blankets for this incredibly refreshing restorative yoga pose. Judith Lasater recommends supported Seated-Angle Pose in her book, “Relax and Renew: Restful Yoga For Stressful Times” for times when you just can’t get to bed. This pose cools and calms every system in the body. 1. Sit nice and tall and spread your legs wide. Make sure you don’t feel too much sensation of stretch though. 2. Pull the bolster close between your legs, and layer a few blankets on top so that you can forward fold with ease. 3. As you lay forward onto the bolster, wrap your arms around it and turn your head to the left or right – whichever is most comfortable. 4. Stay here for 5-10 breaths. This pose especially benefits the digestive organs and is a great pose to practice if you have a queasy stomach from your evening meal. Your day is simply not complete without a twist! To practice this simple restorative spinal twist, all you need is a yoga mat. However, you can ramp things up with a bolster or a few folded blankets. 2. Bring your knees to your chest, and turn both legs to the left or right. 3. 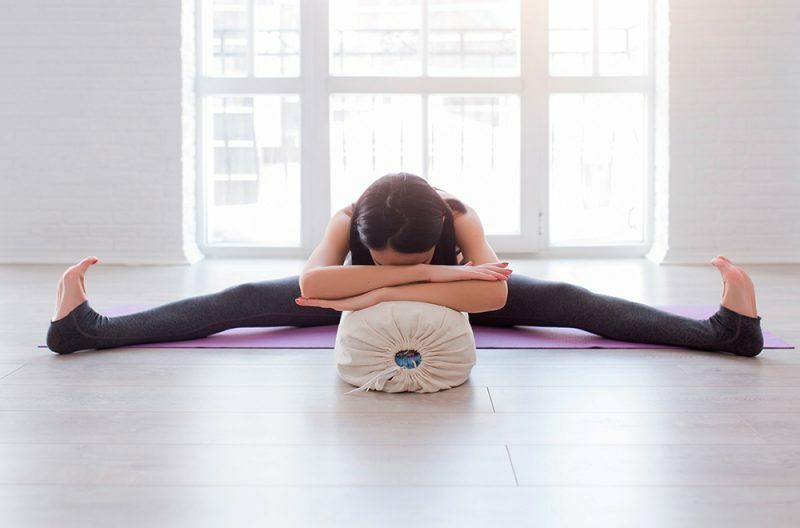 If the stretch is too intense or if you want to make it more restorative, you can place a bolster or blanket either under or between the legs. 4. As you exhale, sink deeper into the twist. 5. After 5 breaths, gently move to twist the other side. If you wake up through the night with tight legs or charley horses, you must stretch your legs before bed! It is recommended that you use a yoga strap as well. 2. With one leg down, lift the opposite leg up. Loop the strap around the ball of the lifted foot. 3. Gently tug the leg towards your head, holding the strap above the head to make a triangle. This is the most relaxing position for the shoulders. 4. After 5-10 breathes, switch to stretch the other leg. If you practice just one pose before bed, this should be it. Whether you have restorative yoga props or not, you can practice this pose. You can also practice it while you are laying in bed getting ready to fall asleep. This pose helps to stretch the groin, inner thighs, and hips while also relieving things like stress, anxiety, depression, poor circulation, and hormonal imbalances. 1. To get into the pose, either lay back in bed or with your back on a bolster. 2. Bend both knees and bring your feet together so your legs sprawl out like butterfly wings. 3. If the inner thigh stretch is too much, place pillows or yoga blocks under your thighs. 4. Close your eyes and sink into the pose. 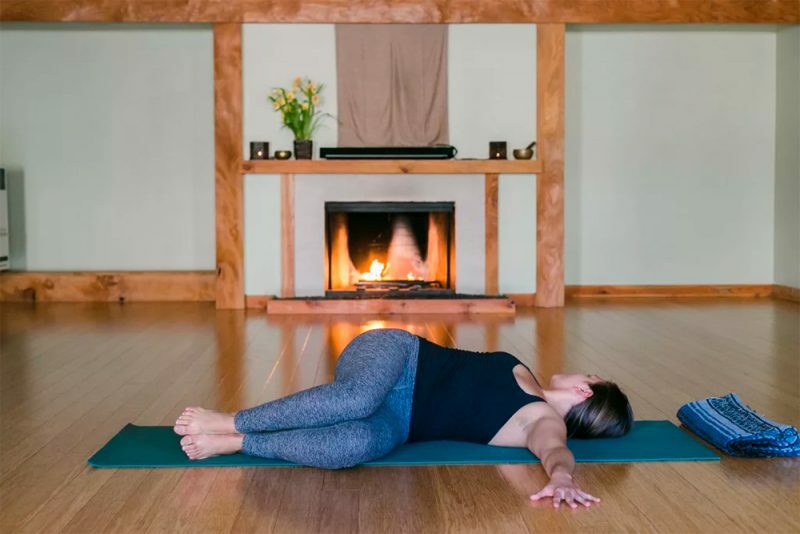 In her book “Relax and Renew: Restful Yoga For Stressful Times” Lasater claims this pose reduces fatigue and headaches, and helps with digestion. Additionally, this pose can help with constipation that comes from long travels. All in all, it is a wonderful pose to practice every day! To end your restorative bedtime practice, crawl into bed if you haven’t already. You can practice child’s pose by pulling your pillow underneath your torso or by placing your yoga bolster in the bed and using it the same way. 1. To get into the pose, get on your hands and knees. 2. Spread your knees wide and pull in the bolster or pillow. 3. Rest your buttocks on your heels and let your torso lay onto the support. 4. Turn your head to the left or right, whichever is more comfortable. If you have neck pain, consider laying a thick blanket on top of the support and rest your forehead on it. This will allow you to breathe freely while also keeping your neck straight. 5. Hug your arms around the bolster. After holding child’s pose for a few moments, move into Corpse Pose (Savasana). If you are prone to lower back pain, stress, or hormonal imbalances, slip a yoga bolster, pillow, or rolled blanket under your legs. Sink into the pose, feeling cozy and secure, and allow yourself to fall asleep if the urge strikes you. That completes a bedtime yoga sequence that is sure to help you get a wonderful night’s rest!